The Los Angeles Police Department officers who shot and killed a homeless man on Skid Row received specialized training for dealing with the mentally ill. The investigation shows the man was Tasered before he grabbed an officer’s gun, which malfunctioned. Police were responding to a robbery call around noon on Sunday. They said the homeless man "repeatedly refused to comply with officers demands," ABC News reported. 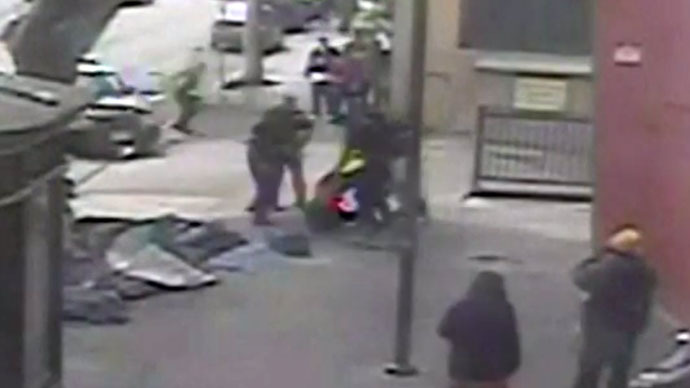 Footage of the incident shows a group of LAPD officers scuffling with two people. After two officers dragged one person away, others wrestled the second person to the ground. One of the officers is heard saying: “Drop the gun!” About five shots can then be heard. The man was identified on Tuesday as 39-year-old Charley Saturmin Robinet, a French national, the Los Angeles Times reported, citing two sources familiar with the investigation. He was part of a group who was convicted of robbing a bank in 2000, during which Robinet pistol-whipped one of the tellers. He was sentenced to 15 years in a federal facility, but was released in May, according to online federal prison records. However, witnesses said that the man, whom they called Africa, had recently been released from a psychiatric facility after spending 10 years there. "This is an extreme tragedy," LAPD Chief Charlie Beck told reporters Monday. "We feel great compassion in the LAPD for people who live in conditions of homelessness and often mental illness with no treatment." 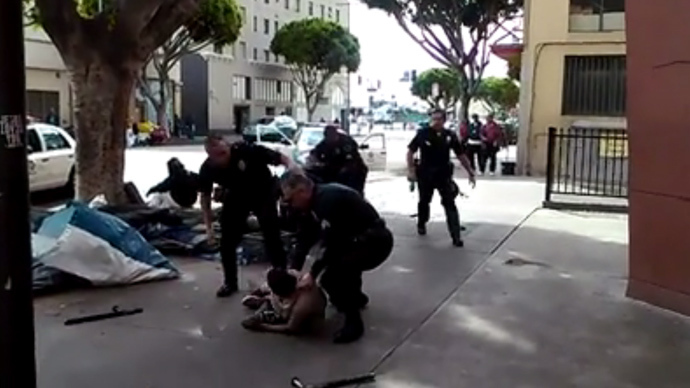 "The Skid Row population is very transient, obviously, and this individual had only been there a short amount of time ... so I don't know about his familiarity to the officers," he said. The officers involved with Sunday’s shooting, however, were familiar with the neighborhood and its long-term residents. They were assigned to the LAPD’s Safer Cities Initiative, designed specifically to deal with issues and crime on Skid Row. "Several of the officers had participated [in] and completed our most extensive mental illness training over a 36-hour course," Beck said. But the officer who cried out that the man had his gun is a rookie, and has considerably less experiences than the other three. LAPD did not give details on how much training the new cop had. All officers must go through at least an 11-hour course, the Associated Press reported. "All officers are trained for instance in dealing with the capacity of mental health issues that people have out there," LA Mayor Eric Garcetti said. "These [LAPD] officers get an additional training above and beyond that." The week-long, 36-hour Mental Health Evaluation Training (MHIT) covers all aspects of interacting with mentally ill residents, the police chief said. "The way you have conversations, the way you offer options, the way that you give some space, the body language that you portray, the way that you escalate, all of that is part of the training," Beck said Monday. "I will make judgment on that when I review the totality of the investigation, but on the face of it, it appears they did try all of that." RT’s Manila Chan, a Los Angeles native, says that the officers policing Skid Row and downtown LA are beat cops. Chan noted that she has heard officers ask Skid Row residents if they are on medications and seen them buy food for the homeless. “They interact with people all day long, They’re hands-on,” she said. Rick Ruiz, a convicted felon living on Skid Row, agreed with Chan’s assessment. He told KNBC that he was angered by Saturday's shooting, but that he was inclined to cut the police a break. "They do the best that they can under the circumstances, this is like a jungle out here," Ruiz said. "After seeing what happened [Sunday], the officers might have saved something from happening that could have been worse." When the officers tried to take the man known as Africa into custody, he resisted. At one point, they attempted to use a Taser that LAPD Commander Andrew Smith said was “ineffective.” The "click-click-click" sound that accompanies the use of the less-than-lethal device can be heard on the recording, police spokesman Sgt. Barry Montgomery told the LA Times. 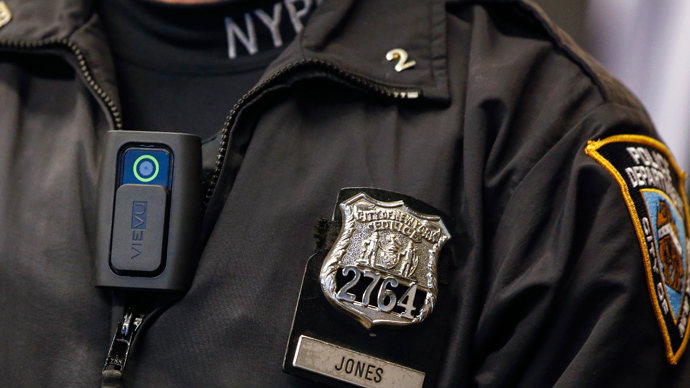 Used correctly, Tasers can and do subdue suspects, but factors such as distance between the officer and suspect can have a dramatic impact on efficacy, Newsweek reported, citing several Taser experts who spoke generally about the devices. David Hayes, retired chief of the Alton, Illinois Police Department and presently assistant director of the Southwestern Illinois Law Enforcement Commission (SILEC), said a plausible explanation for the Taser in this situation is that only one of the two probes may have landed on the man, preventing the electrical circuit from completing. Landing both probes can be difficult during a physical interaction like chasing a suspect or tussling with him, Hayes told Newsweek. The Taser may not have been the only equipment that failed to operate correctly during Sunday’s incident. "In an odd twist to the incident, the standard issue LAPD Glock 9mm pistol the man allegedly was trying to grab from an officer became inoperable during the struggle," KPCC’s Frank Stoltze reported, citing Smith. The magazine that holds the bullets partially popped out of the gun, and one round was caught in the “ejection port,” Smith said. “That's what we call a class three malfunction. At that point, the gun won't fire." On Monday, Beck showed reporters photos of an officer's gun with alterations that he said were consistent with a struggle over the weapon. Along with the photos of the gun, Beck also referred to video footage of the incident. “There's also a screen grab from a privately taken video,” he said. “If you examine that, it appears that the suspect's hand is reaching for the officer's waistband in the area where his pistol would be located." Two of the involved officers were wearing body cameras as part of the LAPD’s program to equip all its police with the devices. Beck said he won't release the officers’ body cam videos while the investigation is ongoing, Mashable reported. That announcement is in line with the department’s policy that footage would only be made available through criminal and civil court proceedings. The probe into the shooting may take up to five months, a LAPD source familiar with the incident told ABC News. The police chief has watched footage of the shooting from several angles, including videos taken by at least one witness, the two officers’ body cams and a security camera about 75 meters from the incident. The CCTV footage was provided by the Union Rescue Mission emergency homeless shelter. 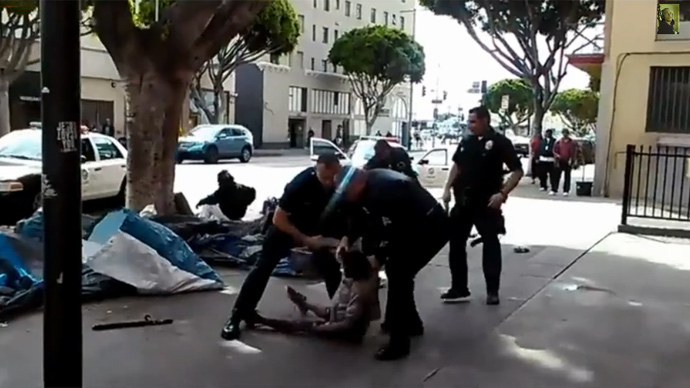 The LAPD has not identified the officers involved in the Skid Row shooting, but Beck said two were treated for injuries at a hospital and released, and one is now using crutches. According to data analysis by the LA Times, there have been 12 fatal officer-involved shootings in downtown Los Angeles since 2000. There were none in 2014 and one in 2015 before Sunday's incident.